I’ve been trying to get this outfit posted since Friday but we have had bad weather so I haven’t had my sitter since Wednesday. We just got a couple more inches of snow so it looks like I’ll have a couple more days of one on one time with my little guy. I do love this quality time with him and being able to focus on him and not anything else. If I don’t have a sitter, I try and blog while he is napping but lately he has been needing me to be with him while he naps. The 30 minutes I do have, I spend cleaning up lunch or making myself lunch and just when I think I have time to sit and do some work I hear him cry. I’m hoping throughout the day I’ll be able to write a little bit here and a little bit there. I’m not revealing the gender. Thought I should put that out there first. I do want to share a little about this pregnancy. If you guys have specific questions I would happy to do a whole post, not fashion related, to your questions. In the meantime, my first topic is that I cannot catch up on sleep! I’m well into my second trimester and I’m still feeling exhausted because I can never sleep in. I try to go to bed`early and some days I am able to be asleep by 10:30pm but most nights it’s past 11pm and I’m not done doing what I need to do. Since Saturday, Myles has got up 15 minutes earlier each morning! Why is this happening. Not too long ago he woke up at 7:45 and this morning it was 6:45 AM! It’s dark outside at that time. I have been taking little naps while he naps which is helpful. With my first pregnancy I was sleeping at least 9 hours no matter what trimester I was in. Some people don’t need a lot of sleep to function, I’m not one of those people but I am trying to do my best to not lose my patience even though that’t the first to go when I’m tired. Another really different thing about this pregnancy is that I barely feel this baby move. At first I thought it was because it’s just not going to be as active as Myles. I was looking forward to that because Myles’s movement was insane in utero and he doesn’t stop moving today! During one of my ultrasounds the tech couldn’t get a good picture for a while because the baby was moving so much! The reason I don’t feel this baby as much is because I have an anterior placenta. Anterior means the placenta is placed at the front of my uterus, so I have my skin, uterus, placenta then baby. A lot of this babies movements are absorbed by the placenta. I do still feel it move every day which is what I want and it makes me so happy to feel those flutters. The main reason I don’t feel this baby move as much as I did with my first is because I’m not still enough to focus on this babies movements. I am too busy with Myles. That goes with all second time mothers I imagine, I know it did with all of my friends. I feel a little guilty not being able to talk to this baby and focus on it’s every move. I know I need to get over that feeling because I’m going to be in for a lot of guilt after this baby comes, trying to balance it all. So far I’m still able to wear heels! I wore heels on my 28th birthday when I was 36 weeks pregnant with Myles. I actually wore wedges but they were pretty tall. I feel good getting dressed up with my bump sticking out. I honestly don’t wear heels as much this pregnancy because of Myles. Last night I wore boots with a heel to the Grizzlies game and Myles took off down a hall and I could barely catch up to him! I did have the baby bag on me as well, but still, I need to be able to keep with my child! He’ll be outrunning me in no time! I love how this outfit came together. 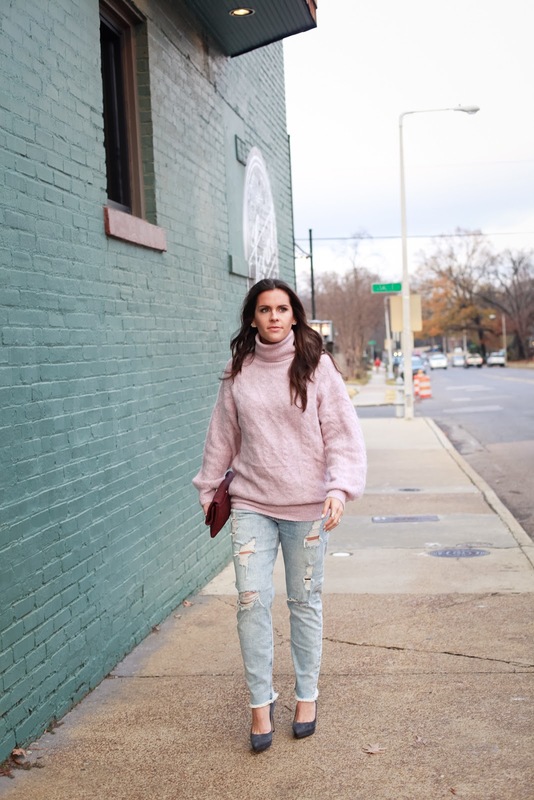 This sweater can be pulled down and worn with leggings too but while I still fit into jeans I wanted to make sure I to wear the jeans! I bought it while I was in NYC and my friend took me to her favorites store, Aritzia. They had such cute things and a great sale going on too! 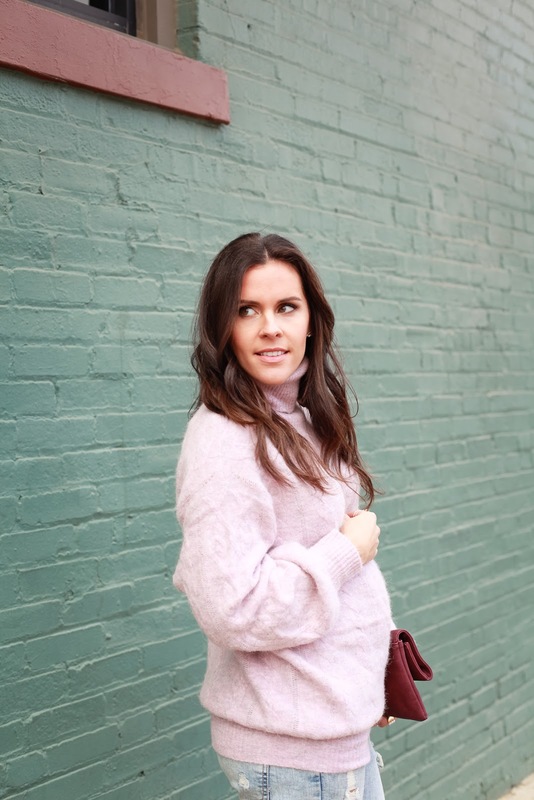 My jeans are from Express and aren’t maternity and I was able to button them! They are low rise so fit under my bump and are a loose fit. The jeans are probably supposed to fit looser but I really love them. They are slightly acid washed without screaming 80’s! The length of these jeans is a little tricky for me. I had to wear a pump that exposed some of my foot. I might end up cutting the hem of these jeans to be shorter so I can wear them with other shoe styles. Would you wear this sweater with jeans or leggings?